Not only is Jambalaya fun to say, but it’s also fun to eat!! Art takes wild turkey and wild rice and adds them to this Louisiana favourite. Mixed in with some other fresh vegetables and herbs this is true comfort food. Note: if you want to make this dish more jambalaya-like, add sausage and Cajun seasonings to the turkey chunks when frying. 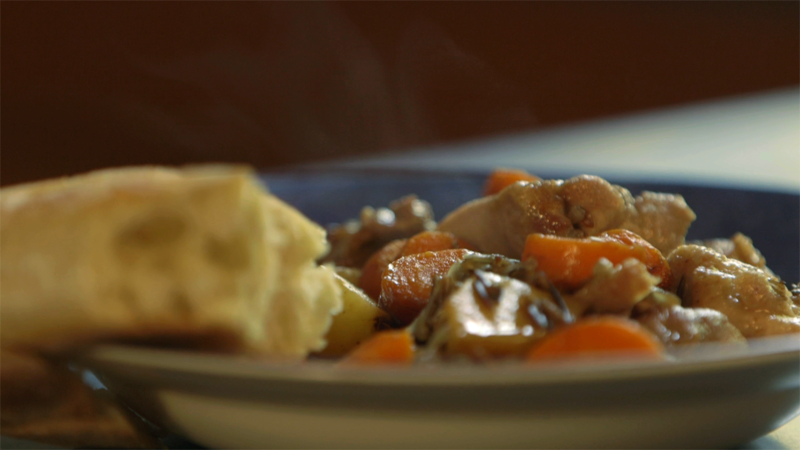 The wild turkey & wild rice give this stew an Anishinabe or Eastern woodland distinction but farmed domestic turkey will also work fine in this recipe. • boil wild rice in water or broth over med heat for 20 mins until grains begin to soften but not split. • preheat the broth in stewing pot & bring to gentle boil. • meanwhile, cut turkey leaving skin on (who would remove all that flavour anyway? ), dredge with flour & brown in heated & oiled skillet along with the onion chunks & sage leaves. • when turkey and onion chunks are nice & brown empty skillet, grease & all into heated broth, add the partially cooked rice and continue to boil gently for another 15-20 mins. • meanwhile, fry up the carrots and potatoes in the oil (use some butter or bacon grease for extra flavour if you wish) until brown then dump into the stew pot. You can slide it in gently if you wish but dumping feels much better. • Add bouillon, salt & pepper, stir and taste once bouillon cube is dissolved. Adjust flavourings accordingly. • Simmer the stew for 20 minutes until vegetables reach desired level of tenderness. • Serve with oven baked bannock or frybread. This rustic stew serves 2 to 3.